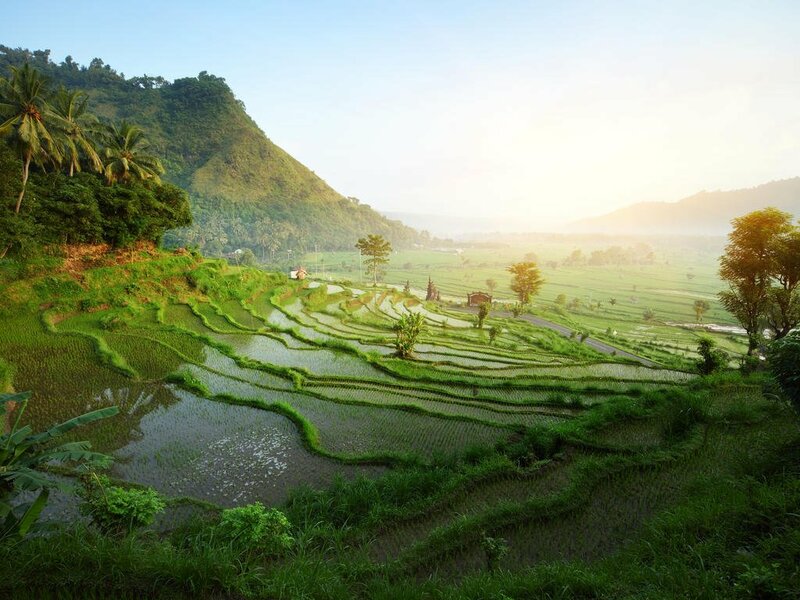 With 18,110 islands, 6,000 of them inhabited, Indonesia is the largest archipelago in the world offering a virtually unrivalled range of holiday options. 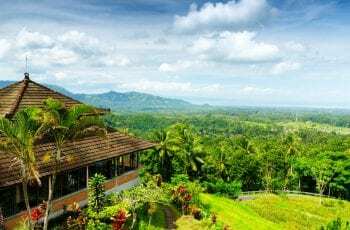 While the picturesque island of Bali remains the most well known and the most popular of Indonesia’s tourist destinations, there is so much more on offer for those willing to step off the beaten track. Pack your itinerary with visits to: the historic monuments and temples of Central Java; the world renowned dive sites of idyllically remote Raja Ampat; the extraordinary Island of Komodo, home of the unfathomably large Komodo Dragon; as well as a range of vast tropical forests providing sanctuary to incredibly diverse wildlife from Orangutans and other primates to critically endangered Javan Rhinoceros and Tigers. The range of choices is mind-boggling but, however you decide to spend your time on this remarkable group of islands, you are sure to have some truly exhilarating experiences and some unforgettable adventures. For the most part, electrical sockets (outlets) in Indonesia are one of three types: the "Type C" European CEE 7/16 Europlug, the "Type F" European CEE 7/7 Schuko or the "Type G" British BS-1363. It's just anybody's guess as to which of the three types will be installed at any given specific location. If your appliance's plug doesn't match the shape of these sockets, you will need a travel plug adapter in order to plug in. Travel plug adapters simply change the shape of your appliance's plug to match whatever type of socket you need to plug into. If it's crucial to be able to plug in no matter what, bring an adapter for all three types.Electrical sockets (outlets) in Indonesia usually supply electricity at between 220 and 240 volts AC. If you're plugging in an appliance that was built for 220-240 volt electrical input, or an appliance that is compatible with multiple voltages, then an adapter is all you need.But travel plug adapters do not change the voltage, so the electricity coming through the adapter will still be the same 220-240 volts the socket is supplying. If your appliances are not compatible with 220-240 volt electric output, a voltage converter will be necessary. CurrencyRupiah (IDR; symbol Rp). Notes are in denominations of Rp100,000, 50,000, 20,000, 10,000, 5,000, 2,000 and 1,000. Coins are in denominations of Rp1,000, 500, 200, 100 and 50.The import and export of local currency is limited to Rp5,000,000, amounts more than that must be declared. The import and export of foreign currency is unlimited. 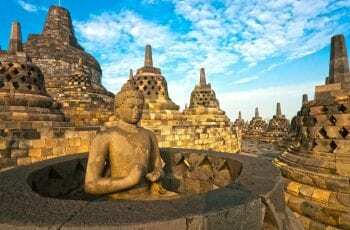 However, amounts exceeding the equivalent of Rp100,000,000 must be declared.Although there should be no difficulty exchanging major currencies in the main tourist centres, problems may occur elsewhere. Watch out for on the street money changers who may try to trick visitors out of their cash. The easiest currency to exchange is the US Dollar. Do not accept notes with a lot of visible wear and tear as these may not be accepted by merchants. The best exchange rates are found in major cities like Jakarta and Bali.BankingBanking hours: Mon-Thurs: 08h00-14h00; Fri: 08h00-12h00; Sat: 08h00-11h00 (some branches).American Express, MasterCard, Visa, Diners Club and Eurocard credit cards are widely accepted in Jakarta and the main tourist areas. In more remote areas, it is best to carry cash in small denominations. ATMs are available in larger towns and at airportsbut be aware that many have a maximum withdrawal limit which can be as high as Rp3,000,000 or as low as Rp400,000. This can be overcome by putting your card again but be careful as you may be hit with a bank fee each time.There is limited merchant acceptance but traveller’s cheques can be exchanged at banks and larger hotels, although they are becoming less common and more difficult to exchange. To avoid additional exchange rate charges, travellers are advised to take traveller's cheques in US Dollars. American Express is the most widely accepted. Water used for drinking, brushing teeth or making ice should be boiled or otherwise sterilised. Drinking bottled water is advised. Milk is unpasteurised and should be boiled. Powdered or tinned milk is available and is advised. Avoid dairy products that are likely to have been made from unboiled milk. Only eat well-cooked meat and fish. Vegetables should be cooked and fruit should be peeled.In Indonesia food is very cheap with most meals averaging around or under 100,000 IDR in higher-range restaurants and around 15,000 IDR for street food or food at lower-range restaurants. Since most Indonesia’s population is Muslim, most dished are considered as Halal (not containing pork).The staple diet for most Indonesians is nasi (rice), but this is swapped on some islands with other starchy foods such as corn, sago, cassava and sweet potatoes taking the place of rice. Whilst there is some similarity to other countries within the region, Indonesia’s location as a trade route means the diet has been highly influenced by other cultures like Spain, Portugal and China.Indonesians like their food highly spiced – look out for the tiny and fiery hot red and green peppers often included in salads and vegetable dishes. Seafood is a regular feature on menus (with salt and freshwater fish, lobsters, oysters, prawns, shrimp, squid, shark and crab all available). Coconuts are often used for cooking. A feature of Jakarta is the many warungs (street stalls); each specialises in its own dish or drink.A 10% tip on restaurant bills is standard unless service charge is already included. 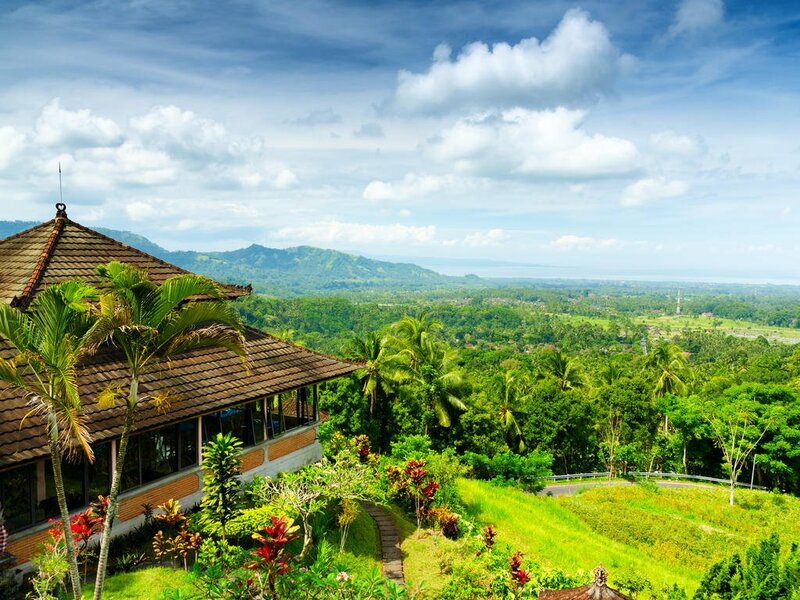 Indonesia has a tropical climate which is highly variable from area to area. The eastern monsoon brings the driest weather (June to September), while the western monsoon brings the main rains (December to March). Rainstorms occur all year. Higher regions are cooler. Temperatures average between 23°C (73°F) and 28°C (82°F) all year, but this tends to be humid heat, with humidity varying from 70% to 90%. Peak time for tourists to travel is in June, July and August, although prices will be higher; those travelling in the shoulder seasons of May and September could get lucky with both weather and prices.Muddy roads can be a deterrent to travel in the wet season. Keep in mind that during local holidays public transport can be clogged, accommodation hard to find in holiday areas and businesses close. Indonesia has a good domestic flight network linking most of the larger towns to Jakarta. Domestic operators include Garuda Indonesia (GA) (www.garuda-indonesia.com), AirAsia(QZ) (www.airasia.com), and Merpati Nusantara Airlines(MZ)(www.merpati.co.id).Indonesia has a Rp10,000-40,000 departure tax for domestic flights, depending on the airport of departure.Travelling around the Indonesian islands by car is very variable, with much depending on which island you are on. Self-drive is possible but be aware that the standards of driving and road conditions, can be quite poor.Around half of the road network is paved and there are good road communications within Java and, to a lesser extent, on Bali and Sumatra. The other islands have poor road networks.Car hire services are available from a number of international and local companies. It is also possible to hire cars with a driver but you will be expected to pay for your chauffeur’s food and accommodation. An International Driving Permit is required. If you don’t have this, it is possible to get a temporary tourist driving licence issued in Denpasar.Many visitors hire scooters and motorbikes but care should be taken to ensure you hire vehicles from a reputable dealer, have correct documentation and are aware of the risks – accidents are all too frequent. Helmets are compulsory.Driving in Indonesia is on the left-hand side of the road. Speed limits are usually 30-40kph (19-25mph) on inner city streets with a maximum of 60-70kph (37-43mph) elsewhere. Seatbelts must be worn.Taxis are widely available in bigger more tourist focused cities and towns. Ojek (motorcycle taxis) are available in cities and towns and they congregate at road junctions. The driver should provide a helmet and you must agree on the fare before starting the journey.Jakarta is the only city with an established conventional bus service of any size, and it has a comprehensive network. Elsewhere bemos (minibuses) are the main way to travel around. Bemos are communal minibuses; fares should be negotiated in advance.Rickshaws include the motorised bajaj, which seats two passengers, with the driver in front; and the becak, which is pedal-powered by a rider sitting behind two passengers. However, the latter are banned from Jakarta city. Fares should be negotiated in advance.Chauffeur-driven cars are widely available and advisable as the standard of driving is poor.The train operator in Indonesia is PT Kereta Api (www.kereta-api.co.id). There are three classes of travel, Eksecutif (Executive), Bisnis (Business) and Ekonomi (Economy), but first-class exists only on principal expresses. There is some air-conditioned accommodation. Children under three travel free in economy and business without taking a seat, and pay 10% of adult fare in executive class; children aged three to ten pay half fare in economy and business and full rate in executive.In Sumatra, trains run between Medan and Tanjong Balai and Medan and Rantu Prapet in the north, and Palembang and Panjang in the south, but are unreliable. An extensive rail network runs throughout Java. The modern, air-conditioned Argo Bromo Anggrek service, which is Eksecutif class only, with refreshments included, links Jakarta and Surabaya; it departs daily and nightly.There are also other express services. 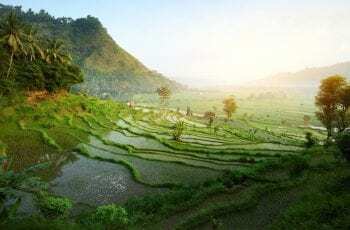 Between Jakarta and Bandung there is a train every one to two hours, Eksecutif class (journey time – about 3 hours) and then thrice-daily trains on to Surabaya.Main ports:Padang Bai and Benoa (Bali), Tanjung Priok (Jakarta), Belawan (Medan) and Sekupang (Batam).PELNI (tel: (21) 633 4342; www.pelni.com), the state-owned shipping company, has good standard passenger liners serving all the main ports across the archipelago. ASDP (Kapal Ferry Cepat)operate fast boats on a small number of routes. Foreign cruise liners also operate on an irregular basis. Luxury cruise ships offer trips to various destinations, including the eastern islands (leaving from Bali). Bring lightweight clothing with rainwear; cottons and silks will be most appropriate. Warmer clothes are needed for cool evenings and upland areas, thicker cottons and woollen garments may work best. Smart clothes such as jackets are required for formal occasions, and it is regarded inappropriate to wear swimming clothes anywhere other than the beach or at sports facilities. Women should observe the dress code in Muslim areas that requires shoulders and legs to be kept covered. Please consult your health-care provider 4-6 weeks prior to travel to ensure you are receiving all required vaccinations, and that the medication has enough time to take effect. We highly recommend the purchase of travel insurance with medical benefits, and that you bring any personal medication with you. Please also check with your health department prior to departure for any changes in health regulations.It is essential that comprehensive medical and travel insurance be taken out when visiting Indonesia as the standard of local medical care is poor and very expensive.Required Immunizations/Vaccinations:• Yellow Fever- required for travellers coming from a yellow fever infected country. It is otherwise not required or recommended. You should be vaccinated at least 10 days before you travel, as this will allow enough time for your body to develop protection against the yellow fever infection. Your proof of vaccination certificate will only become valid after this time.Recommended Immunizations/Vaccinations:• Malaria prophylaxis – highly recommended for all travellers (even if you are only visiting malaria-free areas as there has been an increase in malaria in southern Africa)• Japanese Encephalitis – recommended for travellers spending a lot of time outdoors or whose trip is lasting more than a month• Hepatitis A – recommended for all travellers over one year of age• Hepatitis B – if not previously vaccinated• Typhoid – recommended for all travellers• Rabies – recommended for travellers spending a lot of time outdoorsMalariaIt is inadvisable for pregnant women to visit malarial areas as malaria infection during pregnancy can be detrimental to both mother and child. Malaria can be prevented if you are sensible and take basic precautions, such as:• Use plenty of mosquito repellent. Some camps provide a locally made repellent but please bring your own as there may be skin sensitivity.• Wear long-sleeved shirts and trousers/slacks in the evenings.• Please use the mosquito net over your bed where supplied/available.• If staying in a bungalow or tent, spray with a suitable insecticide to kill any mosquitoes that may have flown into your room.• Mosquito coils are also effective. Indonesia has a high crime rate. Theft and petty crime is common in tourist areas and on public transport so it is advised that you keep your belongings with you always. 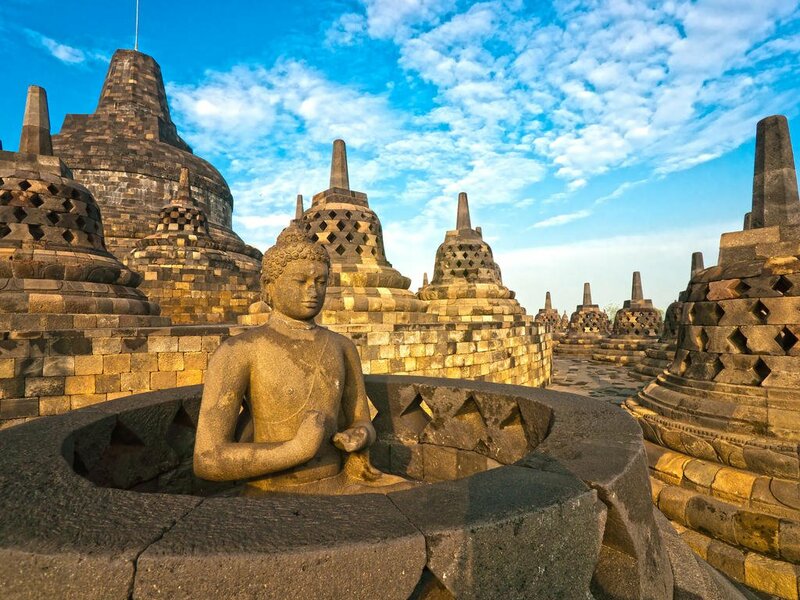 Visitors should also make sure to keep an eye on Indonesian current affairs before visiting since religious violence and unstable politics are an ongoing problem in the country. Make copies of all your important documents such as passports, driver’s licenses, credit cards, etc. Keep copies with you and back at home. If anything is lost or stolen this will be a lifesaver.Passport:Passports must be valid for at least 6 months beyond the intended departure date. Please ensure you have at least two blank visa pages (not endorsement pages) in your passport.Visa:U.S. citizens do not require a visa for stays under 90 days. Non U.S. citizens should consult with your local embassy. For stays over 30 days a 30-day visa can be obtained upon arrival.